Zelda games are tidy and elegant. They may be grand adventures, but the best of them feel carefully-pruned. They're about one hero, Link, saving the world. They're role-playing games, of a sort, with minimal dialogue, a few stats, and a small number of inventory slots. They lack the excesses and bloat of so many other swordsman-save-the-world games. Hyrule Warriors, a new Zelda-themed action game for the Wii U and one of the console's big Nintendo-published, if not Nintendo-made, releases for the fall, in contrast, is messy and rough-edged. It's all hacking and slashing and collecting items and loot, managing inventory. It's a game of grinding—playing the same or similar parts repeatedly—to unlock new characters. It's a hyper-Zelda in which throwing one bomb is never enough. No, if you're going to toss bombs, you're going to toss several at a time. Playing Hyrule Warriors is the experience of being warned somewhere in the game's leaf-pile of menus that you've now collected more than 10 of the same sword and need to delete one of them. It's an upgrade skill tree for every character and the chore of having to spend the same loot on the same upgrades to add the same ability to each of the game's 13 characters. It's the game that lets you play as Link or Zelda or Impa or Darunia or Sheik or Fi or Princess Ruto or Lana or whoever else is on the roster and might be available to save the world. A Zelda game feels hand-sculpted, its parts united by an artist's intent. 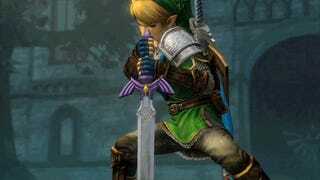 It's the hero's sword eventually being swapped out with the Master Sword when the story calls for it. It's some lovely soundtrack music. Hyrule Warriors feels like math and chaos. It's stats. It's a sword of 88 attack points and three configurable power-up slots. And it's a new sword you just picked up with 106 damage and two open slots. Might you have some other weapons in your inventory to smelt them with? It's those lovely Zelda tunes remixed as heavy metal. I'm a Zelda guy, not a Dynasty Warriors guy. I can have a favorite Zelda, because I've played nearly all of them. I don't have a favorite Dynasty Warriors, because I've barely played the series. And so I was intrigued and then a bit disappointed and then, in a roundabout way, happy to have played Hyrule Warriors. The new Wii U game is theoretically an amalgamation of the two series, though it is less peanut butter combined with chocolate than it is peanut butter painted to look like chocolate. 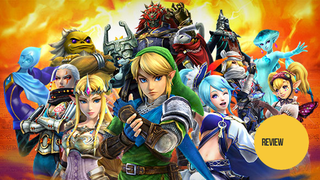 Hyrule Warriors is really a Dynasty Warriors game that just looks sort of like a Zelda. It's nearly as simple as that. I've tinkered enough with the Warriors series to know this. 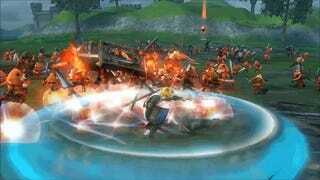 Like other Dynasty Warriors games, Hyrule Warriors is a third-person action game that puts you on a large map full of hundreds—eventually thousands—of enemies. Your mission is to cut through them with the effort of a barber trimming a wild head of hair. Your character is one of the game's many warrior heroes that you've unlocked. Even Zelda herself is a badass slayer of bad guys in this one. You play level by level, in this case with each level based on a location from the Zelda series and filled with bad guys and bosses from Zelda lore. There are 60 minutes on the clock, as if there is any chance you'll need even half that time to kill the villains. Hyrule Warriors is a mostly mindless action game. You play much of the game by firing off whichever button combos you've unlocked for your best weapon, the one you've pulled from your bulging inventory to wield in battle. As you slay weak enemies,you watch a counter tick up into the 10s, hundreds and thousands. You slaughter. Despite the abundance of enemies, you are rarely in jeopardy. But you still need battlefield awareness, so you spend a decent part of each level glancing at an on-screen mini-map. The game's mini-map—a simple schematic of the level you're in—always appears on the right side of your TV screen. The map is full of blue and red dots that represent friendly and enemy troops. Areas on the map blink. Trouble! Run there and help your soldiers out. Dashed lines appear connecting one part of the map to another. Alert! That's the path of a key ally in need of escorting from one location to another. You are the one-man—or, more likely in this game the one-woman—cavalry, rescuing your troops as you seize a base or a spawn point and turn the tide. Sadly, your flock of troops are too dim-witted to do much of this themselves. I mean, it's cool to be able to fight with a fleet of Gorons behind you, but I guess we shouldn't be surprised that they appear to be as dumb as the rocks they mine. To play a Dynasty Warriors game like Hyrule Warriors is to inhabit the shoes of the most effective warrior-general on the battlefield, to dash from skirmish to skirmish, claiming bases, pushing back enemy assaults and eventually, gradually, rallying your troops. As you play, as you fight, you cause that schematic on your screen to be drained of red and to fill with blue. Most battles that I played lasted about 25 minutes, and the transition from being outnumbered to outnumbering the enemy was regularly entertaining though usually incredibly easy. A game like Hyrule Warriors should be a rush. It should feel like a series of heroic, strategic comebacks. It should be a series of interesting, desperate battlefield decisions, but at its default normal difficulty it's just a series of alerts telling you where to go next without much risk that you'll ever fail. Somehow, though, a game like Hyrule Warriors can't help but be button-mashing fun. There's just so much going on. And what's even better for people like me: there's so much Zelda stuff going on. Whoa! That's a Moblin. Insane! That's an army of Stalfos. Cool! I'm getting back-up from Fi. Wow. Did they really just drop Ghoma into the fight? Clever. They just awarded me a hookshot. There's a Bombchu! Is that a Poe? Hey, that upgrade ability is named after Oni Link. Sorry, that's how they got me. As I said, I'm a Zelda guy. I have been for more than 20 years. And, short of Link's Crossbow Training, I've never been able to play a game that simply celebrates the characters and lore of the Zelda series. Mario fans get that all the time. The Mario role-playing games and tennis games and golf games and party games and all sorts of other Marios offer the pleasure of letting you bump into Shy Guys or Goombas in some new setting. They show you Bowser and Waluigi meeting and, I don't know, racing go-karts? What have Zelda people gotten other than great Zelda games? Oh, the pain. We've never gotten a major fan-service game, never gotten, to put it in more positive terms, an interactive celebration of Zelda's characters and lore. That's what Hyrule Warriors is. It's a game that lets me play as Impa and lets me run around as Ganondorf and lets me travel to the worlds of three different Zelda games—Ocarina of Time, Twilight Princess, and Skyward Sword—and lets the characters from those games inter-mingle. It's a game that puts Ganondorf, Zant, and Ghirahim on the same team—and if you don't know what that means, then, yeah, probably stay away from this one. The game's story very loosely matches other Zeldas in that you start as a heroic young guy named Link, are recognized as a champion by Princess Zelda, retrieve the Master Sword about mid-way through the game (massive stat upgrade—though other optional weapons might have even better stats) and eventually tangle with Ganondorf. But you do so by connecting alternate Zelda timelines form the aforementioned Zelda games. We meet and control some new characters along the way, including the blue-haired Lana who seems too chirpy for a Zelda game but whose magic-block based combo moves are some of the most well-implemented and useful attacks in the game. Even more delightful for Zelda fans, you can embark on an "adventure mode" that presents the overworld of the original Nintendo Entertainment System Zelda but turns each of the sectors of that map into a gateway for a special Hyrule Warriors challenge—kill X number of enemies on this Hyrule Warriors map in Y minutes and stuff like that. In the adventure mode, you're able to see any of the game's heroes as NES sprites. Neat, right? And back in the main mode, via a day-one free download, you can unlock the absurdly powerful pixellated sword and shield from that first game. Fun stuff. This is a tough game to judge. The mindlessness of its action feels like the antithesis of the thoughtfulness expected of a player vying with the puzzles and traps of a carefully-made Zelda dungeon. The insult to the player's free-time—the reliance on excessive loot collection and grinding and replaying of challenges and levels just to unlock characters or maybe get a better weapon—feels like an affront to any great Zelda game's perpetual push of the player to discover new and delightful things. I nevertheless feel the makers of Hyrule Warriors have found the silver arrows for my weakness. They've made a game that lets me keep bumping into so many beloved Zelda characters. They've made the equivalent of a TV show's special holiday episode or a comic book adaptation of a favorite movie. These are characters I care about in a setting that isn't their native land. In the absence of a true Zelda game, I will settle for a game like this. Just this once. The game is just fun enough, I tell myself. I don't have to grind. I don't have to unlock other characters. I can be happy that I just took a tour of some favorite Zelda locales while chopping through some favorite Zelda enemies. How can I ever be against throwing bombs in Dodongo's mouth? And, let's be honest, it was probably the nods to Majora's Mask that won me over, after all. Note: This review was originally published on September 17, 2014 but was bumped up for the game's official release date.